This is a salad I have making for many years and it has been modified and adapted often to suit my tastes and fridge stock. But the recipe below pretty much is what I consider to be the perfect combination. It is ideal as a main meal served with crusty bread for a light lunch or supper. 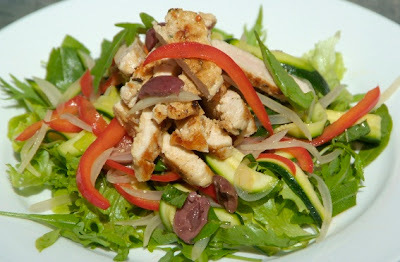 When I make it as a side salad to a meaty main, I usually replace the chicken with feta or toasted nuts. I also consider this salad to be ideal for people who aren't crazy about salad as it has great robust flavors and lots of substance, in contrast to the light leafy variety. It can also be prepped ahead of time and just assembled when needed, which makes it perfect for entertaining. makes one main meal portion and three side salad portions: increase as needed. 1 handful of lettuce leaves of your choice. Combine all the marinade ingredients and rub the tenderised breast with it. Leave this in the fridge until ready for use. Combine all the ingredients in a mixing bowl and toss till they are coated in marinade. Leave this in the fridge, tossing from time to time as you think of it. For the chicken, heat a dash of oil in a pan and get the pan searing hot. Fry the chicken for about 2 minutes on each side until cooked through and golden brown. Set the chicken aside and allow it to cool in the fridge. Assemble the salad just before serving. I placed the salad leaves on a plate, topped this with the marinated veggies and stacked the chicken breast, which I had sliced thinly, on top. There should be enough flavour not to need extra dressing.